Launched in premium movie theaters in 2012, Dolby Atmos has revolutionized cinema surround sound, discarding the decades-old channel-based sound mixing approach in favor of much more advanced object-based sound mixing that features the ability to place sounds in specific planes - horizontally all around you as well as vertically via overhead speakers. Apple AirPlay seamlessly integrates your favorite iOS devices, including the iPod touch, iPhone and iPad so you can enjoy all your favorite iTunes tracks wirelessly. There's also DLNA 1.5 compatibility to you can enjoy content from your home PC or Mac. Equipped with the full Audyssey Platinum suite of advanced DSP algorithms, the AVR-X7200W features Audyssey MultEQ XT32 automatic room acoustic correction. With the supplied measurement microphone, MultEQ XT32 analyzes each speaker's output (including the subwoofers) at up to 8 measurement locations and generates precision digital filters that optimize each channel for the correct frequency and time domain response. The AVR-X7200W is also Audyssey Pro Installer ready. Denon's exclusive AL32 Multi Channel processing provides ultra high resolution digital audio filtering along with precision noise shaping on all of the audio channels to deliver shimmering detail in the highs, along with smooth natural midrange and a broad soundstage with improved imaging. Our advanced Eco amplifier mode adjusts power consumption according to signal level, and there's an on-screen Eco Mode display that lets you see the power consumption reduction in real time. With a single subwoofer setup, room acoustics and the subwoofer's location may not deliver optimum deep bass response. Instead, because of room resonances, deep bass quality may be uneven. With the AVR-X7200W's dual subwoofer outputs, you can connect dual subwoofers, and place them in different parts of the room, and enjoy smoother and more accurate deep bass response. The high quality speaker terminals feature multi-way connectors to handle various types of cable terminations, and they're all color coded for correct hookup the very first time. Color coded speaker labels are also included to ensure quick and correct hookup with no hassle. There's also the option of connecting 2 pairs of main (L/R) speakers - choose one pair for stereo music listening and the other pair for movie surround sound. 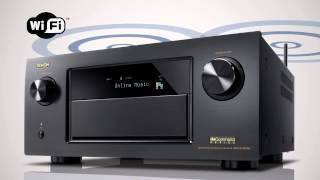 As part of Denon's IN·Command series of custom integration-friendly A/V components, the AVR-X7200W is equipped with a range of features that provide enhanced control capabilities and compatibility with 3rd party and custom integration solutions. There's also an RS-232C serial port on the rear panel that allows connection to a whole-home control system, and the AVR-X7200W features Control4 SDDP (Simple Device Detection Protocol) certification and Crestron Connected for quick and easy integration with Control4 and Crestron home automation equipment. The AVR-X7200W comes with a Quick Setup guide, and has an intuitive on-screen Setup Assistant that will have your system fully configured with a minimum of fuss and bother. You can even control the setup via your PC's web browser, or use our available Denon Remote apps with your favorite smart device. In addition to the available Denon smartphone apps, we've created a new Denon Remote app specifically for tablet devices, and it's available for iPads, Android tablets as well as the Kindle Fire. On the front panel, there's a convenient USB port that lets you stream tunes from your iPod, iPod touch, or iPad and charge it at the same time. You can also use the USB port to stream tracks from a USB memory device or NAS, and the AVR-X7200W features DSD (2.8 MHz) and lossless AIFF, ALAC, FLAC,and WAV decoding for the ultimate high resolution music experience.